..is a good motto to live by. It is the Boy Scout’s motto (Be Prepared) and growing up, this was my mother’s motto (thanks, Mom). 🙂 In nursing, we were taught to always be prepared for anything and as professionals, we’ve been hard wired to live up to that motto. As nurses, we are expected to always be prepared for an emergency, always be prepared to resuscitate a patient, always be prepared for a disaster, always be prepared to start an IV in a dehydrated patient on the first try, always be prepared for a bad day, always be prepared for no lunch, and always be prepared not to get off work on time. That’s reality and the resourceful people that we are, we are always seeking for ways we can be ahead and be prepared so we will always be prepared. Always be prepared can mean saving time especially in a busy department. For example, in a very busy infusion center, always being prepared may mean preparing for the next day’s patients prior to leaving for the day. The nursing staff makes sure that supply carts or shelves are restocked, infusion pumps cleaned and charging, and medications and solutions are available in stock. I have no problem with “always be prepared” but I have a problem with one of the practices I have observed in a few infusion centers so they can “always be prepared”. IV bags of 0.9% Normal Saline spiked and IV tubing primed with solution then stored for use over the next few days. There are no evidence or studies to support this practice. There is no guarantee that IV bags are spiked aseptically – especially when in a hurry. 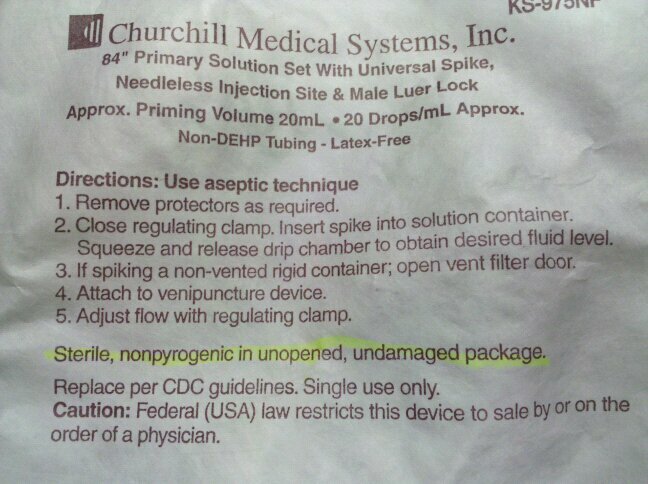 The spiked IV bags/primed tubings are stored in an area left unattended, thus there is no way to ensure if it has been tampered with or dropped on the floor by housekeeping. 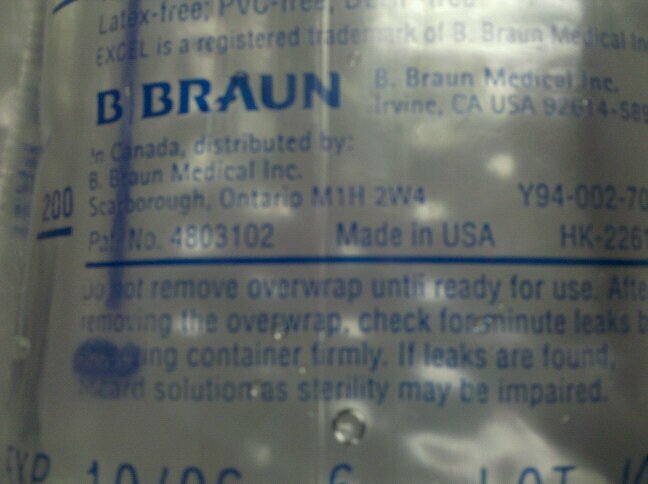 Any unused spiked IV bags and primed tubings must be discarded and not used beyond 24hours. I get it that we can save time where we can but not if we are putting the patients at risk. The spiking IV bags and priming IV tubing ahead of time is putting the patient at risk for potential contamination and possible complications of blood stream infections. Let’s protect our patients…not harm them! Oh by the way, it takes 90 seconds to remove an IV bag from the over wrap, place it on the IV pole, remove the IV tubing from the packaging, spike the IV bag and prime the tubing…….enough said!! Disclosure: The pictures are intended to show the label on the product or packaging only and not intended to implicate the manufacturer. Welcome to the Grown Up World! !